After The Father comes its companion piece, The Mother. Having carried off acting honours with Kenneth Cranham in The Father (shortly to be revived again in the West End), the Theatre Royal Bath and the Tricycle continue their showcasing of Florian Zeller, the French playwright and novelist. And why not, if you know you’re on to a good thing? Zeller is currently one of the hottest theatre properties going. A third play, The Truth, comes to the Chocolate Factory in March. The Mother, however, if you’ve seen The Father, is an almost too-close-for-comfort stylistic reprise. Once again we are locked in to a one room set; once again scenes replayed with carefully calibrated variations; and once again, as with The Father’s concern with a disintegrating mind from Alzheimers, The Mother highlights another ageing phenomenon, the maternal one known as `empty nest’ syndrome – the daily care of off-spring, replaced when they leave home as adults by paralysis and emptiness. Remarkable concerns for a young man, Keller’s style with its repetitions, cleverly conceived disorientations and vaguely threatening behaviours can become oddly irritating, if impressively skilful. 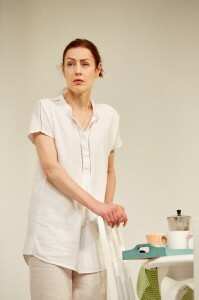 One of the main reasons therefore for seeing The Mother is, as for Cranham, to watch Gina McKee. Quietly, McKee has somehow steadily acquired the status of `national treasure’. 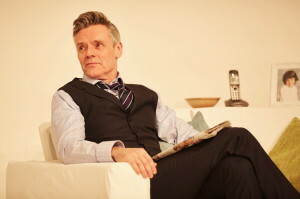 Here, as Anne, the mother, she charts her increasing mental fragility and collapse with mellifluous subtlety, observed by the equally excellent Richard Clothier as Peter, her husband, alert to every move in Laurence Boswell’s unnerving production with its heightened sense of light and sound. A study in emotional confusion for audience and characters alike, where does the truth lie? How much of what we see are aspects of Anne’s imagination or delusion; how much reality? 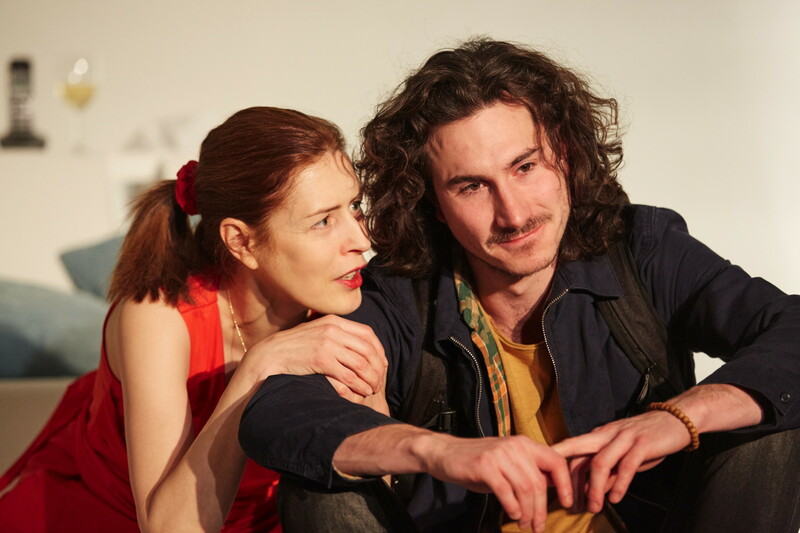 Like a feline stalking the undergrowth, McKee tracks Anne’s aggressive, cruelly comic truths and smothering mother-love, beautifully counter-balanced by William Postlethwaite as her too much loved, desperate to be free, son, Nicholas. Classy stuff, Zeller’s Father and Mother are not just the story of two families, but, like Pinter, transcend themselves to become generic archetypes if distinctively middle-class ones. Transfer written all over this one, I’d say. This entry was posted in 2016, Reviews and tagged empty-nest syndrome, Florian Zeller, Gina McKee, Laurence Boswell, mother love, Richard Clothier, Theatre Royal Bath, Tricycle Theatre on January 30, 2016 by Carole Woddis.